Kerala truly has everything that can make your dream vacations come true, as if the swathe has actually passed against the “magic mirror” and transformed into a more buoyant area. This kerala tour package of 4 night and 5 days includes Munnar the gateway of Hills in South India. On the way you can also watch the lovely waterfalls of Cheeyappara & Valara. Thekkady, it offers diverse attractions wildlife sanctuary, hill station, and spice plantation and Alleppy the beautiful coastal town in the Indian state of Kerala. 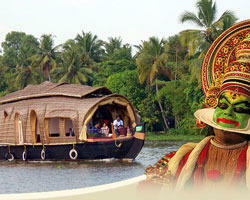 Book your best Kerala trip with Rover holidays Now..! !